Product #20801 | SKU FID88F00-2 | 0.0 (no ratings yet) Thanks for your rating! 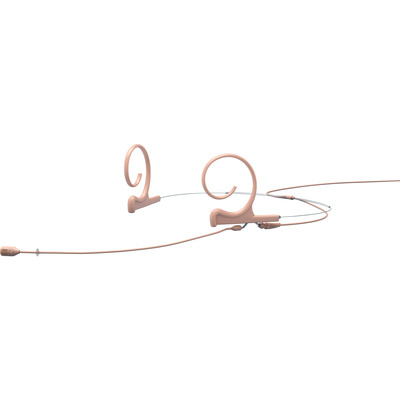 The beige FID88 2-Ear Cardoid Headset Microphone with a 120mm Boom and a MicroDot Connector by DPA Microphones is for capturing professional audio. It is used in various environments in applications such as for singers, public speakers, actors, musicians, broadcast professionals and more. It features a cardoid directional microphone and has a frequency range of 20 Hz to 20 kHz. This microphone offers maximum side rejection and excellent sonic focus on the subject. The FID88 headset microphone is featured with a 4.7" boom and is featured with a 2-ear mount. The ear mount is designed to fit any head and ear size. Just by rotating the boom and the earhook, the microphone can be moved from left to right ear. It is built with a 4.1' cable and terminates in a MicroDot connector. A carry case, cable clip, five color coded identification rings, a pre-mounted pop screen with foam windscreen, and 3 additional windscreens are included.